io9's Halloween Costume Show, Week 2: DIY Ways to Win Halloween! When the annual io9 Halloween Costume Show kicked off last week, no one knew just what to expect, besides awesomeness. We did expect awesomeness. And that is exactly what we got. What Are You Wearing? It&apos;s Time for io9&apos;s Halloween Costume Show! Take a gander at some of the amazing costumes your fellow commenters will be donning this year. Feeling inspired? Then go ahead and show off what you will be wearing this year in the comments below. Pictures of yourself only, please! Commenter beammeup gives us the treat we all really want this Halloween: visual puns! As a high school math teacher, he says that he tries to keep his costumes mathematically themed. Commenter Stephanie Beard shows us how to take 10 bucks (!) worth of fabric and turn it into a pitch perfect Merida costume. This Master Chief costume from commenter Alex Gordon is completely DIY. The ingredients, he tells us, are paper, fiber glass, bondo, and time. Commenter Pam Orita's husband put together this Dalek costume for their son over the last two months. Two months well spent! 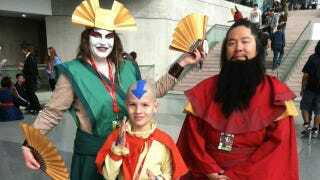 That's commenter DrLocrian (and family), representing the earth, air, and fire benders. Here comes commenter jedibugs as Mojo Jojo! Either Arkham has had yet another breakout, or that's commenter fieryperil's son as the Scarecrow.